The first task is setting up the customer. This process begins in the ACS Finance system. Once the Customer has been contracted we are now ready for Buy Here Pay Here. From the main screen click on the button in the lower left corner of the main screen. This will open the following Customer Information Screen. To add a Customer, click the button. You will be prompted to input the Customer Number. This is the Deal Number from the ACS Finance system. If you enter a Customer Number that is not found, you will receive the following error message. At this time, you have the option to enter the deal without the tie-in from the Finance system. We recommend you verify the correct Deal Number from finance, and repeat the Add Customer process again. If you answer "Yes" to this message you will taken back to the Customer Information screen and allowed to enter all the information manually. This includes you manually entering the contract information into the "Customer Contract Information" tab. WARNING: if you manually enter the customer contract information, and make a mistake, once you update the customer the only way to correct this is to delete the customer record and start over! Once customer contact information is entered manually, or automatically by the Finance Software, this information can not be changed. 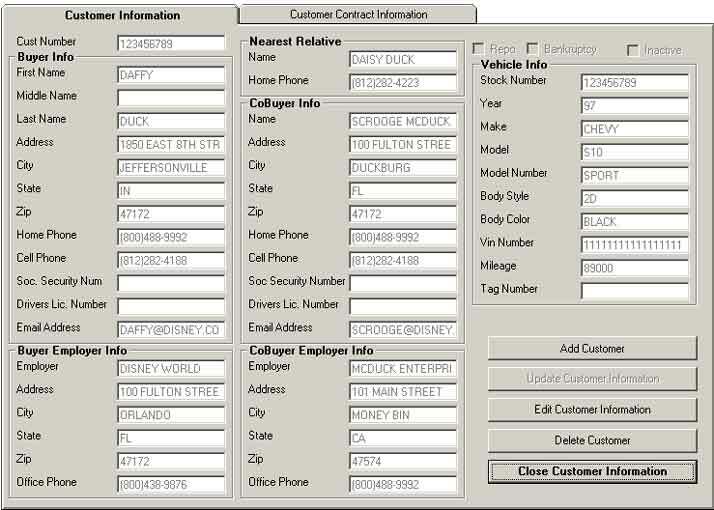 Once the Customer is input into the Customer Information screens, simply click the button to complete the process. Please Note: Once you Update the customer you will not have the ability to change any of the Customer Contract Information. Only Customer Information can be updated once the Customer is initially saved. To edit Customer Information, click the "Edit Customer Information" button. This option will make the Customer Information fields available for editing. When you are finished, simply click the "Update Customer Information" button. To delete Customers click the "Delete Customer" button. You will be asked to verify this selection by typing "Delete". Once you do this the customer will be removed from the Acs Buy Here Pay Here database.